The Project which cost £100,000 was undertaken to overcome space shortages and to catalogue the earlier and more valuable books in the Collection. 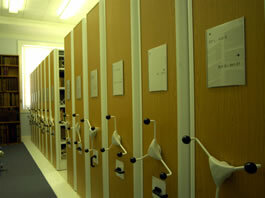 It involved cataloguing more than 15,000 volumes and the introduction of compact shelving to increase capacity. The Gibson and Study Rooms were refurbished and new furniture provided. This website was established and a booklet published to promote the Collection. The Project was supported by APU, East of England Musuems Libraries Archives Council, The Essex Club, Essex County Council, Essex Heritage Trust, Gibson Walden Fund, The Heritage Lottery Fund, The Pilgrim Trust, Saffron Walden Town Council, The Saffron Walden Town Library Society, The Scarfe Charitable Trust, Stansted Airport Consultative Committee, Uttlesford District Council.